A week or so ago I happened to be driving through New Castle past the Wentworth By The Sea, a grand hotel overlooking the ocean, built in 1874. 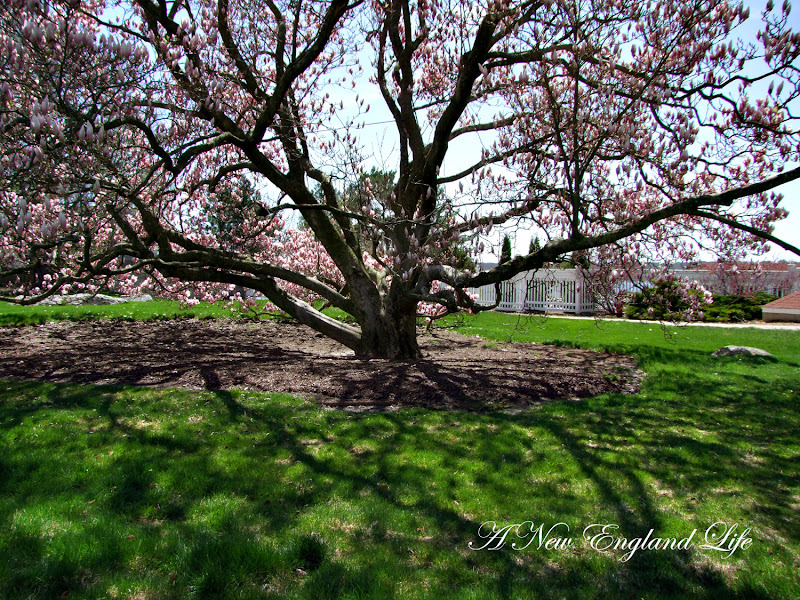 Just for fun I thought I'd take a drive right past the front entrance when I saw this fantastic old Magnolia tree! I have no idea exactly how old it is but judging by the size of it I'd say it's been around a long, long time. I'm actually surprised it survived the recent violent windstorm we had. I'm not really sure if you can see just how large it is but I'd say it's the biggest Magnolia I've ever seen around here. For many years the Wentworth By The Sea sat empty. It was a pathetic, sad sight. We couldn't imagine anyone would ever restore it to it's current glory but they did. If you have a chance be sure to check out their website. The tree is in a rather fragile state, held together by cables. The cables appear to have been there for quite a while too since the bark is growing around the bolts. What a spectacular view from this very spot. Just imagine the sights this tree has seen throughout the years. I thought there might be a plaque somewhere giving some information about how old the tree was but I couldn't find one. *I apologize for being so absent lately. I've been having a major blogging block! Who knows why that happens but when it does I just have to go with it. *Tonight I finally bought myself a Wacom Bamboo Fun Tablet to use with my laptop. I'm hopeful that it will help with my carpel tunnel. I can't use the mouse pad because ... well, I just can't. And using a regular mouse is too much clicking when I'm working on my photos. My niece who went to school for photography said they HAD to use a tablet so she suggested I try it. She uses a Wacom tablet so I did some research and it turns out people are very satisfied with it! I have to say though, as with anything else there is a bit of a learning curve. That is unless you happen to be a teenager, as my daughters will attest. 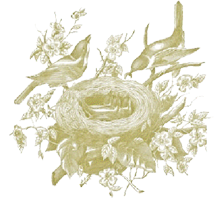 *Thank you for all your input on the birdcage! You too, Jay! For now I have decided to keep it black. Who knows, that may change at some point, but the black looks good for the moment. * And finally, the Chickadee's didn't nest in the house : ( Tonight I finally pulled the nest out and left it on the ground. We have a pair of Bluebirds in the yard who I'm hoping will choose one of the houses to nest in! Whether or not they'll nest in a house with a previous birds nest I don't know but I don't want to take any chances. If they take up residence I'll be sure to let you know! I bought the Wacom Tablet late last year and really never took the time to learn in properly so gave it to my granddaughter who had it figured out right away! I think had I just slowed down and spent the time with the Wacom that it would have been a lot of fun but patience is not one of my virtues. Good luck...have fun with it! Beautiful photos! I'll need to take my mom for a ride one day next week so that we can look at the restored hotel. I had trouble with numbness in my fingers from using the mouse. I've had my Bamboo for a couple of weeks and it's a huge improvement. I think you'll love it. 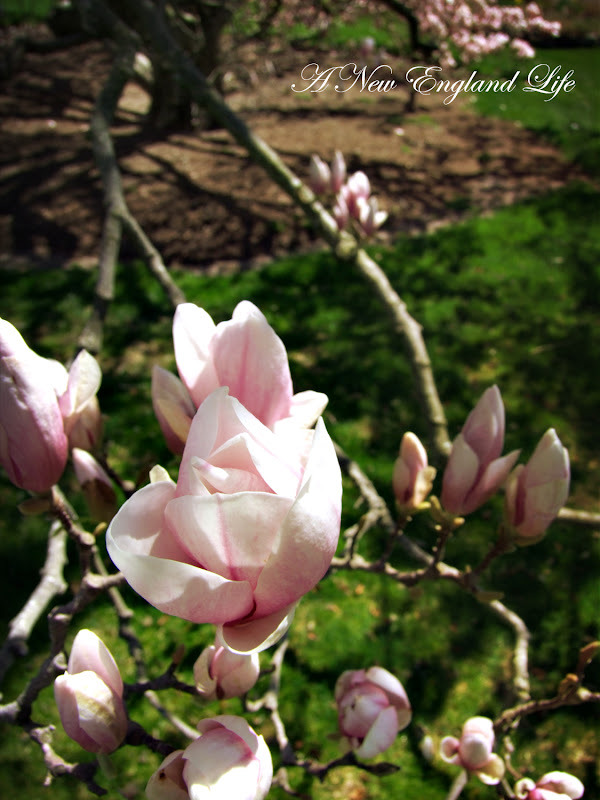 I love magnolias, and that one is amazing Sharon. Wow. That's a time when you wish trees could talk! Sorry to hear about the CTS. I had a release on my left in 1999, and I have it to a smaller degree on the right, but thus far have been able to keep it under control. Hope the Tablet gizmo helps. What a spectacular tree, Sharon! It should be sitting in front of some huge southern mansion! I'll bet the hotel gets lots of questions about it. Thanks for sharing! Gorgeous. We had Thanksgiving dinner there one year in the dining room, what a beautiful property. Oh my gosh that is so beautiful. I've been using the Wacom Intuos tablet for a number of years and can't imagine not having it! If you have the option of different pen tips -- try the felt tip. It seems to give you a little more feel and drag (well, at least for me). I hope it helps with the CTS. I totally understand the blogging block!!!! I know you'll work through it! Gorgeous, gorgeous photos! 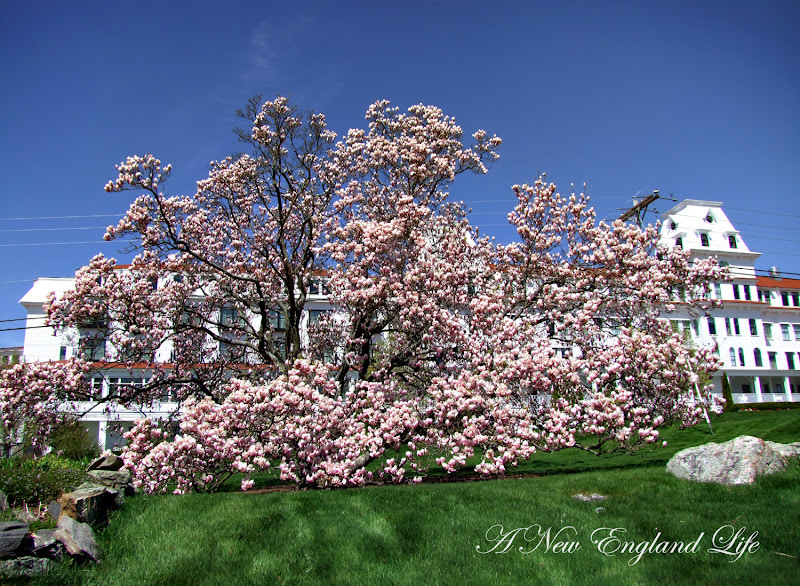 I'm so glad I found your blog, I LOVE New England so much. I lived in Providence for 2 years and it was the best place I've ever lived, I miss it so much! Of course I am following, and will be back to see more New England beauty! What beautiful photos Sharon! You are as creative as ever. Thanks for stopping by to check on my Princess and your kind words. Holy cow! 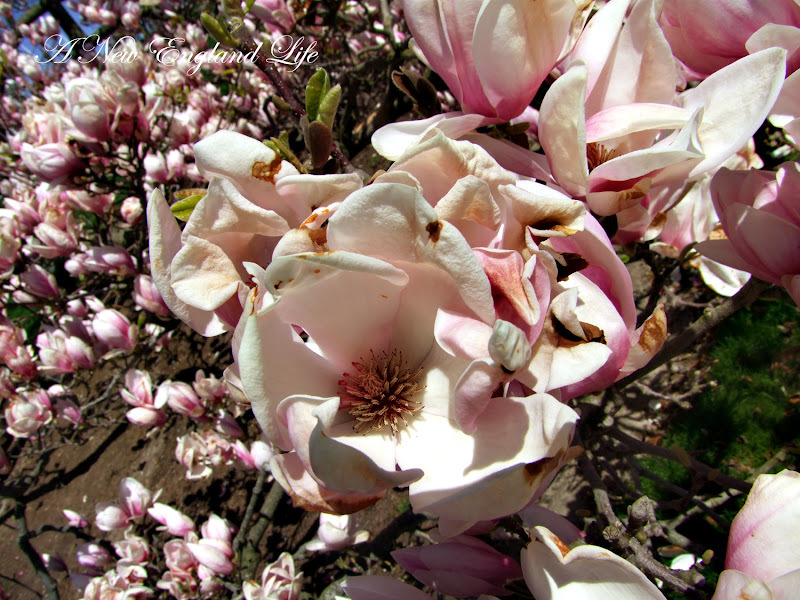 I had no idea those magnolias got that large!! I have a small one; they have such pretty blooms. I like your bird cage and beautiful roses too. 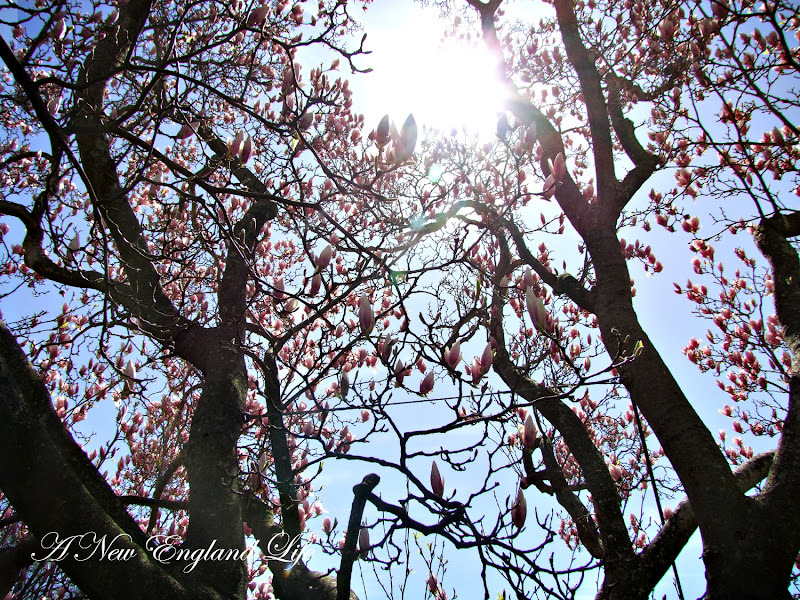 I love that magnolia tree! It looks so grand standing there in all its glory! You did the right thing by emptying the bluebird house. They won't come into the house with a previous nest in there. Good luck with getting the blue birds. That is a pretty spot by the sea. They did a wonderful job with the renovation. Stunning, fabulous tree and grounds...it doesn't even look real, does it?? Wonderful! That is an AMAZING tree! Let me know how you like the tablet. I bought one about a year ago and could never get the 'hang' of it. Hoping your carpal tunnnel doesn't give you too many problems!! Your photography is fantastic. Love these photos. That first shot is my favorite - it makes it look like the tree is nearly as big as the hotel! Just gorgeous. That is amazing. Thanks for sharing. Gorgeous. If I didn't know any better I'd think God sometimes likes to show off. That tree is delicious. 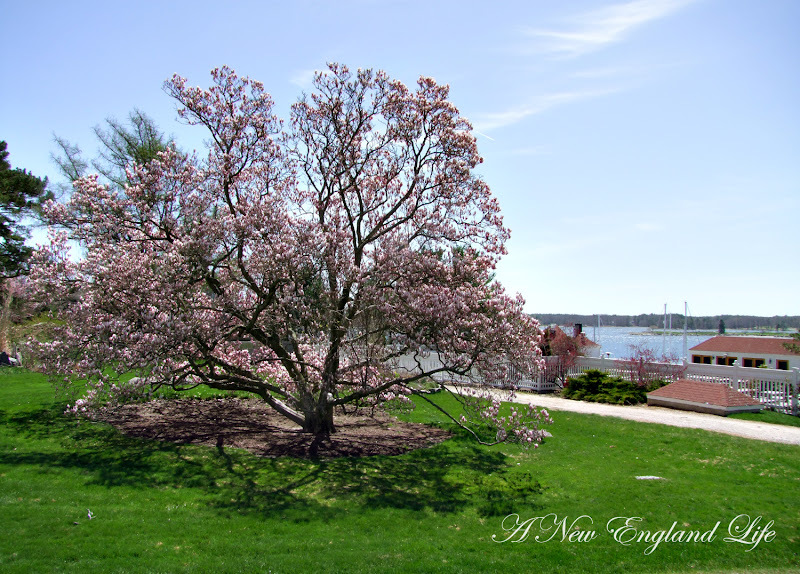 What an incredible magnolia tree! I thought they were little shrubs, the size of a lilac, because that is what grows here in Canada! I couldn't believe that was just one tree! I am so thrilled to see so many comments on this beautifully photographed post, Sharon. 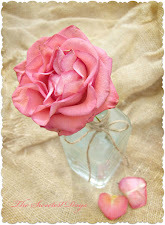 Congrats on your BlogHer featured post here! What a gorgeous location. The tree is absolutely lovely! I don't think I've ever seen one that large. I'm glad they went to the trouble of installing the cables to protect it from the wind. Still, amazing that it has held together this long!